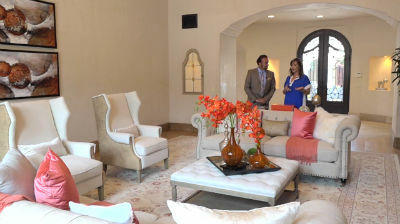 On this Season on Design Santa Barbara we are proud to have amazing and talented Interior designer Shirin staging a beautiful home in Irvin ,California. She is the Principal Designer/Owner at Uber Chic Staging. Shirin has a very fun mind when it comes to staging a home. She has used furniture from Santa Barbara Design Center to feature her staging job along with beautiful rugs hand made from Rugs & More. IT’S ALL ABOUT FIRST IMPRESSIONS.. It’s not that easy to sell your homes these days. Staging is a Marketing Tool! it requires an objective and professional assessment of your house’s strengths and challenge areas, and solutions to help buyers fall in love with what you see, and an action plan. Uber Chic Staging, have a team of professionals, utilizing our passion and our love affair with transformations, Creating a feeling in the room that makes buyers want to come in. Uber Chic honors their clients and work closely with Realtors to help get your house Sold! there goal is to create Home Interior that looks Brighter, Bigger, and more Inviting. There are 5 main factors that sell Homes. Location, Condition, Price, Terms, and Staging. In Addition to Staging, shirin can help with getting your house ready to be on the open market.